In rare cases, Insight may stop responding and requires closing forcefully (or killing). 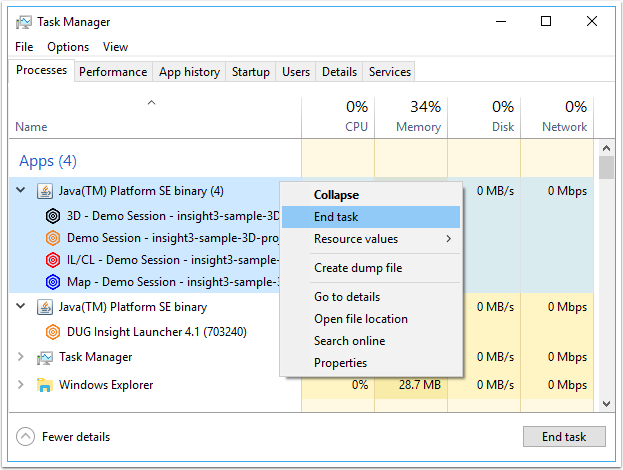 In these situations, close Insight manually using the Windows Task Manager. Type CTRL-ALT-DEL and select Task Manager. Find the program named “Java(TM) Platform SE binary” or “javaw.exe” in the list of Apps. Expand this process to make sure it is the instance of Java running Insight and not other software. Right-click and select End Task. This will kill any copies of Insight that are currently running. Note: When Insight restarts, open the previous session and take advantage of the autosave. It's important to save the recovered session when opening an autosave otherwise the autosaved changes to the session will be lost. See this page for more information on Autosaving in Insight.